LincsFM102.2 B|B|C Lincs traffic update. Holiday vacationers are often spotted wandering around bemused, yet the town is based around a central market square, with one of the easiest navigations imaginable - North St - South St - East St - West St.... Up North St is Conging St, the primary access to the 2 major supermarkets and pay parking. The Police station is down South St.; The library is also seen from the South side of town. In the center of town are 4 banks with Atms (another in Tesco car park, and a pay machine in Mills mini store); the Market is Thursdays and Saturdays. Although most people would probably visit Horncastle by car, it's still possible to get here by bus or train (or Airplane via Humberside Airport!). The town has petrol stations to the West, South and East on the outskirts of the town. Boston Road service station has a mini store and faces the Industrial Estate and Chandlers Subaru. Although the garage no longer fixes vehicles, they rent space at the rear that currently houses Mechanical repairs. 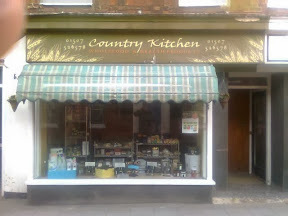 Clarkes up on Spilsby Rd has car sales and repairs, and an old field airstrip at the rear. Shell, opposite, do mechanical repairs and a small mini mart that serviced the adjacent mobile home park through more than forty years of last century. Richard Dear just up the Lincoln Rd (A158), completes Horncastle's immediate quartet of petrol stations. Fulletby, Baumber and Haltham are the next closest, but with shorter opening hours. Dexel Tyre Dock behind the library and HSBC, and Bush Tyres in the old station yard, can be trusted with tuning niggles, tyres, exhausts and such. Subject to any changes in the forthcoming cuts, the omnibus links out of the town are about adequate. There are no service routes north up the A153, and south is barely covered. East - West the Roadcar Company runs an hourly timetable, the No.6 the main route, supplemented with PC coaches No10 route to Lincoln via Bardney which can be found at the Travel Line site. Return Tickets do not cover return later in the week, they are only Same Day Returns. If you enjoy scenic routes, then the Bardney trip is the one. Only 10 minutes longer than the 'main' road, it winds thru several small villages, over the Witham and it's flood plain, and into Lincoln from 'below'. Of the routes heading south, the Brylaine Boston trip is handy for adding to shopping dimensions, with a visit to the quaint old pilgrim father's town. 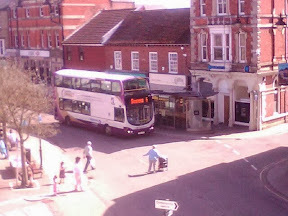 Other shopper buses used to go to Louth and Coningsy. National Express run a coach through the town, and it's possible to pop down to Peterborough for three hours..... The 448 Grimsby-Horncastle-London is best pre booked: 08717 81 81 81 - www.nationalexpress.com, or at the library (or one of the travel agents). Most people opt to go to Lincoln for the train to London. Railway wise, Horncastle lost it's station halt years ago, and one of the nearest tracks is the Skegness-Boston-Lincoln 'poacher line' using East Midlands Trains. Although Metheringham is the closest platform, if buses are needed then one of the main stations is required. The National Rail Enquiries site has details for the stations. The last two times I travelled, the signalling cable had been torn up by thieves in the night, and there were delays as we were walkie-talkied down the line. Cycles are catered for on a first come first served basis, but there's generally space, and the guards allow what safe overflow they can into the carriage seating. Taxis are run locally, and there's occasionally one plying at the back of the market on the Rank. If one travels to Yorkshire or Cumbria a different mindset usually takes hold of the average driver. 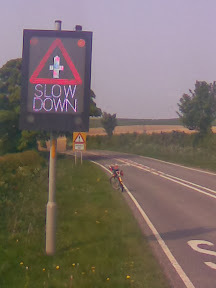 For some reason those visiting Lincs seem to think the Foss Way or A52 are somehow representative of all the roads in the county, causing them to try and do the maximum 60mph on the roads. The Hill in Lincoln should really make them think again, but all too often it's the Wolds that catch them out. There remains little of the Roman road network East of Lincoln - the roads here are basically metalled farm tracks joined together, often at right angles! Narrow, with unforgiving shoulders and verges, Holland and Schleswig had a very similar dangerous network. They installed rumble strips at the sides to marshal vehicles safely back onto the road after many accidents. Here the problem remains, and dropping a wheel into the road edge at anything over 15mph usually means an air bag test. The routes are safe if driven like a driving lesson. Darwin's law works in that the locals know to take it steady and any that didn't are no longer among us. The hills often have 1/7 gradients, the Wold NE of Horncastle a sixth the height of Snowdon, and a graveyard of war planes who thought they were flying over sea level Fen. The most used roads have 'Red Route' warning signs with a fatality number and date since. The B roads have no such luxury, or street lighting, and a fatal crash in Lincolnshire is a weekly occurence. The range of vehicle types plays it's part too, with an army on the move here in autumn and spring consisting of farm machinery larger than the cottages. 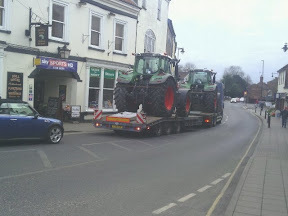 Overtake Articulated Lowloader? No Problem. Factor in caravanners who may have driven their combo 10 times in 10 years, with map reading from satnav or the mrs, and the god awful picture begins to take shape. Boy racers impressing a car full of girl friends. Bikers going through to Anderby creek or Cadwell. Truckers travelling to the ports. Many retirees from nearer London who have 40 years of town driving habits ingrained... As a cyclist in amongst this eclectic brew, I often take several old Roman lanes or little used stretches to get about. A bonus of the farming activity is that even the narrowest of back roads is wide enough for a car and bike to pass safely. The number of dedicated cycle routes has increased with the Woodhall-Horncastle old railway stretch and the Bardney-Lincoln cut, both reducing the chance of cycles meeting traffic and becoming the meat in the sandwich.